Solved Exams, Study Help, Virtual Store. 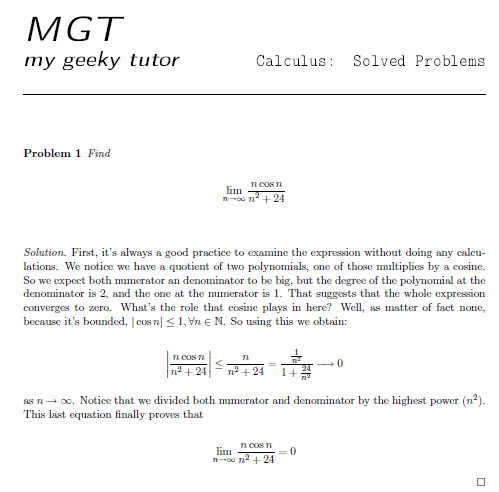 We are constantly developing study guides, list of solved calculus problems to help you prepare for you exams. New series will be added soon! Our review : M. Triola's books are among the best college Statistics books you can find in the market. Very clear approach, it definitely enlightens your view. It's definitely a must have. The topics included are Descriptive Statistics, Confidence intervals, Hypothesis Testing, Linear Regression, Analysis of Variance, Multinomial Experiments and Contingency Tables, and Non-parametric Tests. Our review : This advanced graphing calculator is packed with more features than you might know how to use. The TI-89 Titanium lets you perform the expected functions of an advanced model--basic math, algebra, calculus, graphs, matrices, and statistical functions--and do cool stuff like creating animations. It has a steep learning curve but it's absolutely worth it.